Heaps of sauteed Greens: Collards, Mustard & Turnip Greens are most traditional, but many other greens work as well. I’ve used everything from mizuna to purple sprouting broccoli with good success. Heat the oil and butter in a sauce pan or soup pot over medium heat. Add the onion, pepper, celery, bay leaves, thyme, and garlic. Cook for 15 min, stirring occasionally, then add the allspice and chile and cook for a few minutes more. Add the peas and water. Bring to a boil, then lower the heat and simmer, partially covered, for 40 minutes. Add 2 teaspoons salt and cook for 20 minutes more or until peas are tender. Coarsely chop the greens and saute them with a bit of olive oil & salt in a large wok. Collards will take slightly longer to cook than more tender greens like mustard & turnips. Put a scoop of greens in the bottom of a bowl, pour peas & broth over the greens and serve. Slice stems of chard- cook about 3-4 min with 2 tablespoons of broth. Slice leaves and cook until tender, covered about 3 min. Put chard and remaining broth in blender and whirl until smooth. Should be about 3 to 3 1/2 cups. Melt butter. Saute mushrooms 5 min. Stir in flour and curry powder. Cook until bubbly and slowly add cream. Stir until thickened. Add chard puree and season to taste. Garnish with bacon when serving. Laura’s Disclaimer: This is my grandmother’s recipe exactly as she used to make it. I’ve made it more recently with a few modifications. It is still really good with veggie broth and olive oil. You can leave out the dairy or use soy milk and you can leave off the garnish or try croutons or a bit of parmesan or crisp fried tofu instead of bacon. This recipe came from my grandmother, Beverly Matlock, and it is still one of my favorites! Laura’s Disclaimer: This is my grandmother’s recipe exactly as she used to make it. I’ve made it more recently with a few modifications. It is still really good with veggie broth and olive oil. 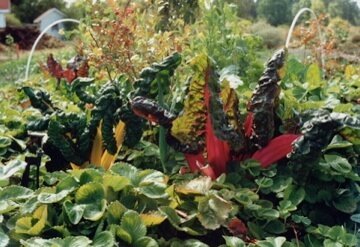 I often cook beet greens with the chard if I have some on hand. Onions, garlic, leeks, or shallots can be sauteed with the mushrooms. You can leave out the dairy or use soy milk and you can leave off the garnish or try croutons or a bit of parmesan or crisp fried tofu instead of bacon.